What are the input and output sections of the cell? Brain cells have both input and output sections. Dendrites are the tree-like extensions that reach out from the cell body. They are the input section of the cell and carry electrical information into the cell body from the axons of other neurons. Axons are the output section of the cell and carry electrical information from the cell out to other neurons. Axons can be extremely long, reaching from the brain all the way down to the base of the spine. While some axons branch into two sections, by and large there is only one axon per neuron. At the end of the axon, the cell branches into numerous axon terminals. One axon can have thousands of axon terminals. 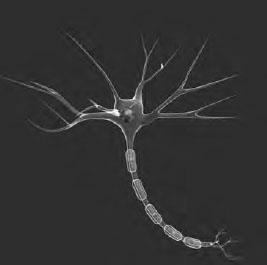 The majority of axon terminals connect with the dendrites of other cells, resulting in trillions of neuronal connections in the typical brain.